Blessed Homemaking: A Great Time to Join Lilla Rose--Free Shipping! A Great Time to Join Lilla Rose--Free Shipping! Blessed Homemaking has recently partnered with Lilla Rose because easy, beautiful hairstyles just go well with busy homemakers who still want to look pretty and feminine. If you've also thought about joining Lilla Rose as a consultant, now is the perfect time to do so because they are offering free shipping on all enrollment orders placed between Monday July 22nd through Wednesday July 31st. This is a business you can even do with your children, especially if you have daughters. My daughters love to wear their "hair jewelry". When you become a consultant, you can also purchase your flexis and other hair accessories from Lilla Rose at a discount. You can join Lilla Rose as a consultant for only $49.95. 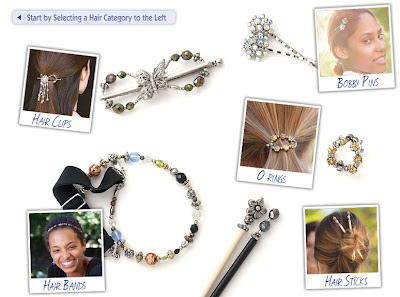 If we start with the Party Kit, can we select the five clip styles and sizes that we prefer for the samples? No, you don't select the styles. You get 1 mini, 1 extra small, 1 small, 1 medium, and 1 large, plus a lot of tools to market your business (like brochures, business cards, etc.) We were happy about all the ones we got though--very pretty! You are sent the different sizes in order to show others what the best size is for them. Hi. I just gave up blogging, but I saw your comment on "A Godly Homemaker" and I would like to say, that we too, are not allowed to have animals in our county where I live. Such as, no goats, chickens....but there is no word about rabbits in our county law. So we have 3 rabbits that we keep outside (give hay in their raised hutches in the winter...they keep warm...summer is actually harder on rabbits then winter). Rabbits, if allowed, are very good, and were used during depression times...A family would raise them and sell to neighbors. We separate our rabbits...they fight. (just for your info). Hi, thank you for taking the time to come here and comment and share the info. I did not know rabbits would be good as I thought they'd yield very little meat. You would just pay me through Paypal. Thank you for the info, Andrea.